Benefits of Clear Aligners – At FMS Dental Hospital Hyderabad India, Clear braces improves appearance of your smile, straighter teeth are healthier in form and function, decrease in trauma etc. Does the thought of getting conventional braces daunt you? Clear aligners can be the ULTIMATE solution for your problem! These transparent and virtually invisible aligners are one of the latest innovations of modern dentistry that work as an amazing alternative to conventional braces. With clear aligners, you can say goodbye to an unsightly metallic smile! 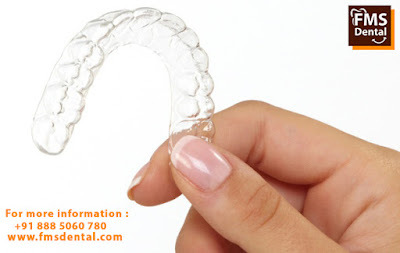 Clear Aligners, certainly, have emerged as a boon for individuals associated with the showbiz world or Page3 personalities and professionals like inspirational orator who need to keep their best face forward 24/7. It also works best for busy-bees like IT professionals and NRIs or expats who cannot afford to squeeze out time for orthodontic appointments. 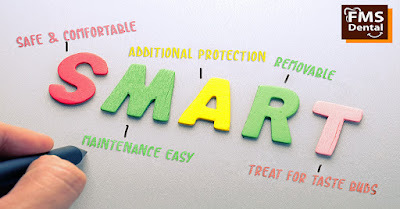 With clear aligners, your entire treatment goes hassle-free and uninterrupted even if your job demands periodic migration. Metal-free virtue and smooth plastic surface of clear aligners make them absolutely safe and comfortable for use. Not only do they straighten your teeth, they add an extra layer of protection to your teeth against grinding or clenching. As they are removable, maintenance of oral hygiene through brushing and flossing is possible. You can smile with full confidence as you know that your snugly-fit aligners are almost unnoticeable. Clear aligners are customized on the basis of the 3-D images of your teeth captured through advanced digital imaging devices. With the help of specialized computer software, the expected movement of teeth is split into several phases. To achieve the tooth movement specific to each phase, a pair of high quality polyurethane aligners is fabricated that needs to be worn for two weeks or more until the desired movement is achieved. Then, they can be discarded and the wearer can shift to the next pair. Basically, the aligners guide the teeth into the actual position through the application of gradual force. International brands of clear aligners like Invisalign has become household names today as they have delivered brilliant smiles to millions of people worldwide. FMS Dental Hospitals, Hyderabad takes pride in being one among the very few Certified Invisalign providers in India. The price of Invisalign at FMS Dental is definitely less than the charges in the West. Isn’t it exciting enough to plan a dental vacation to India!